It’s an appealing name, one that came from America, a title given to the area in New York where so many music publishers kept their offices (it came from the raucous din of so many pianos being played). There was something similar in London, on Denmark Street, just off Charing Cross Road in the West End, which inherited the nickname. This was the centre of the British music industry. It was in the late 19th century that Denmark St. first became associated with the music business. On the fringes of Soho with its low rents and just a short walk from so many of the theatres, it became a locus for sheet music publishers who sold their wares to orchestras and musicians who worked nearby. It was a good business and with so many musicians around, it wasn’t long before the shops on the street began selling instruments, everything from violins and guitars to pianos and the Tin Pan Alley nickname became commonplace. Along with the publishers, managers and promoters also rented offices here, putting virtually everything concerning the music business on one short street. By the 1950s, little had changed – but then again, very little had changed in the music business. Even the advent of rock’n’roll didn’t really alter anything – most things continued as they had before. Deals were done and new kids on the block like Larry Parnes were absorbed into the establishment. The number of instrument retailers expanded, and with rock’n’roll so big, the focus shifted to guitars, basses, drum kits, amplifiers and public address systems – the tools of the new groups. Recording studios had long been the province of the record companies, where men in white coats operated the machinery (truly). One or two independent studios existed, but they were rare animals. 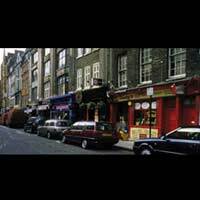 Everything shifted when Regent Sound Studio opened on Denmark Street, the first of several to populate the road. The biggest effect was to take power away from the labels, as bands and managers could make their own professional recordings the way they wanted (rather than to the record company’s specifications). More than that, it put every phase of the business in one tiny area. When the Rolling Stones recorded their first LP there, it signalled that a sea change had happened. For most people, the interest in music doesn’t extend beyond the artist performing the song. But music publishing has been big business for over a century. Indeed, even now the vast majority of songs come from the pens of professional songwriters and this was what made Tin Pan Alley so important. Writers could go from one office to the next, hawking their material and hoping for a deal. In turn, those looking for material – for their artists, for shows, or anything else - could simply make the rounds of the publishers and see what was on offer. With the advent of recording, music publishing took on even greater importance, still acting as a clearing house, but seeing that the composers received royalties on their work (as well as taking a cut themselves). It was, and still is, very big business – artists can make more from publishing than recording in some cases. Denmark Street still exists, and it’s still important to the music business, although more for its retail businesses than anything else. As the makeup of music has changed, so has the street. The studios that were so important for a while have vanished, and many of the publishers have moved elsewhere. Historically, though, it remains a vital link in the musical chain.